SANO brings innovation to plant-based protein for the premium market. Plant-based protein from SANO arrives in this gorgeous, sustainable rigid box. Get yours today and use limited-time-only promo code TBC20 for 20% off your purchase! A healthy lifestyle means something different to each individual. For some, it’s getting enough sleep or doing yoga to combat stress; for others, it means hitting the gym five days a week and counting macros. Simply put, your definition of health will determine your goals, and your goals will determine your behaviors. At SANO, a healthy lifestyle is wholistic, and fundamentally grounded in a devotion to creating the best body fuel available. Organic, plant-based and derived from the best whole foods, their new line of vegan protein powders are set to become the new standard in pure nutrition. They accomplish this while treading as delicately as possible on the environment, which is why they came to Taylor Box Company for a sustainable packaging solution. Vanilla SANO comes in a pre-portioned packet. Order yours today and use limited-time-only promo code TBC20 for 20% off your purchase! SANO is a brand living at the intersection of health and luxury, but they are far from inaccessible. Recently launched this fall through an exclusive NYC fitness studio and spas, they have already established their online subscription service, making it easy for the health-committed to meet their nutritional goals. 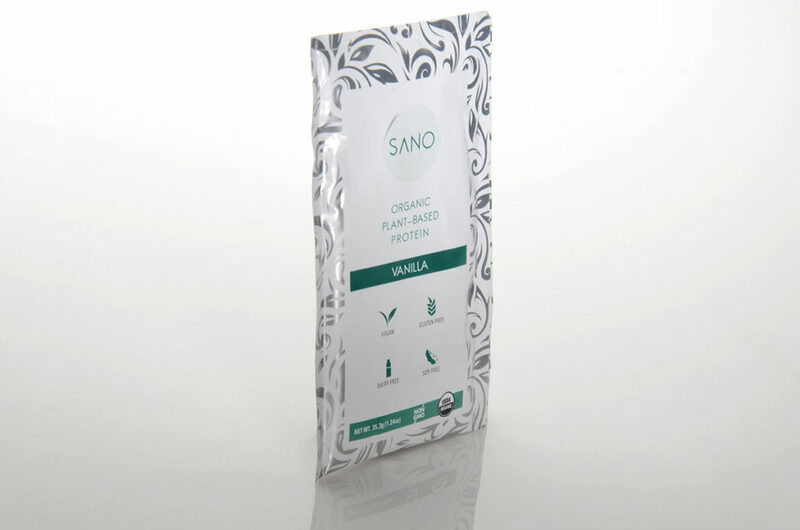 SANO currently offers individually packaged vegan protein powders in two flavors, vanilla and chocolate. These pouches are on-the-go portable and perfectly portioned, so make your shake at home or throw it in your bag for a post workout boost. Minimal ingredients equal optimum results, and a reduced carbon footprint. Organic pea and hemp protein, flaxseed, goji berry and organic cocoa are some of the ingredients that are on the shortlist of SANO’s chocolate flavored powder. Unlike more common whey protein, which is derived from cow’s milk, SANO’s 100% vegetable-based powders aren’t a key cause of global warming. In fact, scientific research suggests adopting a plant-based diet is a great way to improve personal health and cut carbon emissions. A keepsake box for storing your SANO protein or alternative reuse. Order yours today and use limited-time-only promo code TBC20 for 20% off your purchase! Their commitment to a high-quality plant-based protein aside, SANO also expressly encourages their customers to reuse the packaging for their products. Your initial SANO delivery will arrive in the beautiful rigid paperboard box shown here, and serves as an ideal storage unit for your cupboard or countertop. Don’t want to store your pouches that way? Hold on to it as a keepsake box (that’s exactly what we’ve been saying!). Did we mention this box is 100% recyclable? Did we mention it’s made of 100% recycled chipboard? Did we mention it’s made locally in the USA, further reducing its environmental impact? 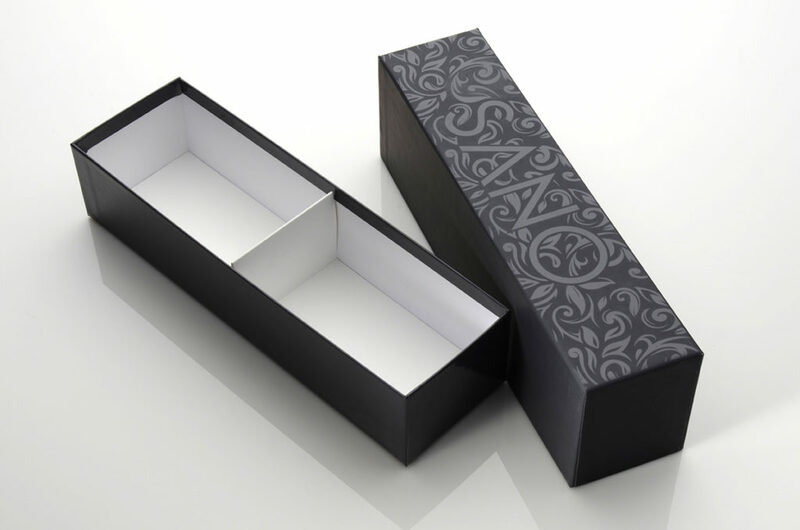 Soft-touch paper makes this box a delight to handle. Order yours today and use limited-time-only promo code TBC20 for 20% off your purchase! Functionally, the packaging is intuitive and accessible. The tray-in-tray, or drawer-style box, is an elegant alternative to the standard, unsightly plastic tub of protein powder. Fourteen individual packets of SANO are contained within the keep-sake box, separated by a paper divider. A precisely engineered design gives the drawer a clean gliding action when it comes to opening and shutting. Haptically, this sustainable box is a delight to handle. Wrapped in 80# litho paper, printed with SANO gray and coated with a soft-touch, lay-flat, scuff-free laminate makes for a smooth, rich tactile experience. The exterior is a stellar example of tone-on-tone decoration that can be accomplished with gloss UV. 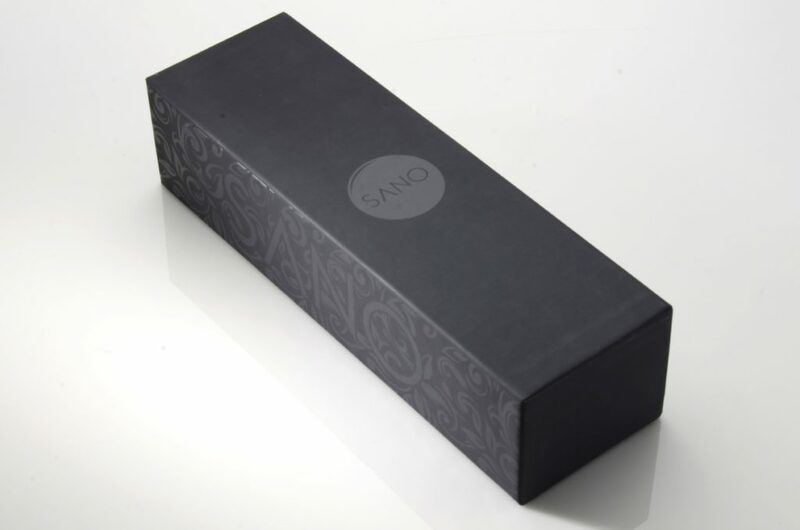 The SANO logo shimmers at the top of the box while an intricate, botanical-style design plays against the matte gray background on the spine. All this contrast accomplished with spot gloss alone, using texture rather than color to accentuate the design, reinforces the luxury experience. SANO encourages customers to reuse their packaging. Order yours today and use limited-time-only promo code TBC20 for 20% off your purchase! As stated on the company website, SANO means “health” in Italian. This is a brand who defines health and wellness in terms of consumers, communities and the environment, and who lives their ethos. It might not be apparent at first, but SANO is doing something special. Gone are the days when the only protein option is a giant, chemically-produced plastic tub of synthetically-manufactured whey powder. SANO has developed a healthier, environmentally responsible alternative, and decided to package it in a likewise sensible solution. This sustainable, recyclable, reusable design minimizes the amount of physical and chemical waste generated. This cruelty-free, organic-forward brand puts the environment first. 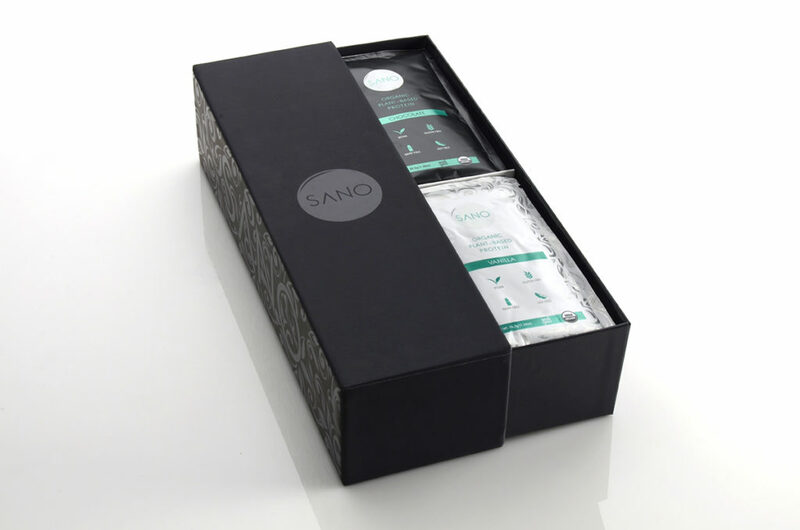 This product and packaging promote not only personal health and wellness, but the health of the entire planet, and we were thrilled to help SANO bring the product to market with a sustainable, beautiful rigid box. SANO is offering Taylor Box blog readers a limited-time-only discount of 20% of your entire first purchase. Use promo code TBC20 and give yourself or a loved one the gift of health and wellness with a subscription to SANO! I got the contact info from Google search. We are looking for some reliable with quality suppliers of cosmetics bottles and packaging to NY. We are a start up, developing new cosmetics to sell in Korea, USA and other countries as well. The first item we are introducing to consumers is a facial toner, made in USA, 4 FL.OZ (or 118 ml). 100 / 200 /500 /1,000 pcs respectively so that we compare it with other suppliers, getting back with you.